Our pork is cut from Tamworth heritage breed hogs raised on our farms. Regarded by many as the aristocrat of the pig world this magnificently long legged mahogany pig with wonderful large pricked up ears will always command attention. 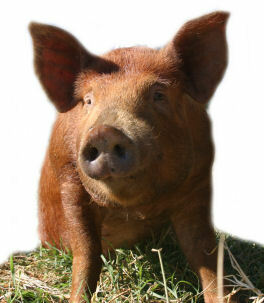 The Tamworth is one of the great 'dual purpose' pigs producing stunningly good pork as well as equally tremendous bacon. In the mid 1990's the Tamworth came top in a taste test carried out by Bristol University using both commercial and rare breed pigs in a scientifically controlled experiment. It was later suggested that further investigation should take place to establish just what it was that gave the Tamworth meat such a distinctive taste putting it way above all the other breeds. Although sometimes referred to as 'boisterous' this should not be interpreted as being 'nasty' or difficult to handle. It is a big pig that is full of life and who could ever expect the 'aristocrat' of the pig world to be anything other than full of life. A loving, talkative pig that is really a gentle giant.